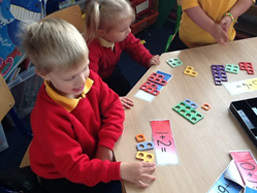 The Early Years is a wonderful facility with a number of discreet sections that are assigned to the different areas of learning within the Foundation Phase. 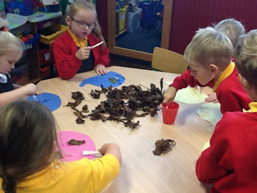 These include Literacy and Numeracy, reading, role play, creative, Welsh, ICT, large construction and modelling areas as well as a large outdoor area. 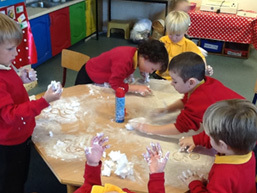 Our extensive outdoor environment and grounds are used by the Early Years pupils all year round. The children have access to a range of playgrounds and outdoor settings, which contribute to providing a wealth of experiences. 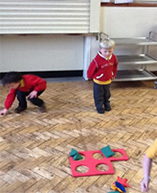 These include the ‘climbing Playground’ and willow area, a role-play area and tricycles area. Large Outdoor Sandpit and play House, mud kitchen and gardening area. 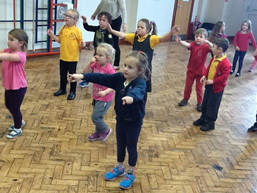 We work with our children to promote, instil and maintain a healthy attitude and lifestyle and of course, a love and enjoyment of physical activity. All the Early Years staff believe that we can encourage children to become lifelong learners by providing a rich, broad, balanced and relevant curriculum and through working in genuine partnership with parents/ carers and the wider community. All children need a P.E. kit comprising of shorts, t-shirt and trainers or daps. Our P.E. day take place on a Monday though we use the field when the weather is fine. Most parents provide a P.E. kit for their child and leave it in school each half term, with it going home to be washed at the end of each half term break. If you would like your child to have a school dinner which is cooked on the premises and of very high quality, these are currently £2.25 per day we run a cashless system. Please ask for information regarding setting this up with school admin. Each day, the children need to bring 2 healthy snacks for the morning/afternoon these need to be labelled. Children are provided with milk and have access to water throughout the day they just need to bring a labelled water bottle. 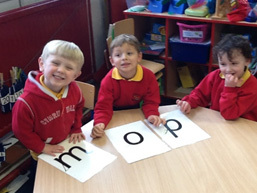 All children in reception are provided with a reading book. It is expected that parents listen to their children read these books, as well as others books of their own choosing at home. In addition to this, the children have a variety of homework activities sent home on a Friday. This is an opportunity to extend in-school learning, and to work with parents at home.